Originally constructed by the Civilian Conservation Corps in 1940, and restored in 2005 by members of the Kent Conservation Advisory Committee and other volunteers, the Mount Nimham Fire Tower is one of the most-visited treasures in the Town of Kent. 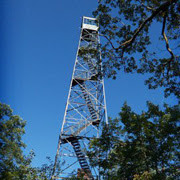 On October 11, from 2-4pm, the Conversation Advisory Committee (CAC) and the Kent Conservation Foundation (KCF) will be hosting a festival at the fire tower to commemorate its restoration and celebrate its value to the community. Prior to the festival, those who want to participate in the CAC’s annual Fall Foliage Hike will meet at 11:30am in the parking area off Gipsy Trail Road (map) to take a guided walk through the woods to the fire tower. Since driving up the road to the top is prohibited, there will be shuttles running from the Gipsy Trail Road parking area beginning at 1pm. If you’d like to volunteer to help with the event, please contact Beth Herr at 228-5635 or at herrszur@comcast.net by October 1 or sooner if possible. We’d really welcome your help. Directions to the festival and other details will follow as the event grows closer. Hope to see you there! Become a citizen scientist and join the Kent Conservation Advisory Committee (KCAC) for its first annual Butterfly Count on Saturday, July 18 from 10am to 2pm. The count will start at the Nimham Mountain State Forest parking area on Gipsy Trail Road. Those who join in on the count will actually be supporting the North American Butterfly Association’s (NABA) efforts while adding to Kent’s Natural Resource Inventory by finding as many butterflies as possible. Okay, just what is a butterfly count? Well, it’s much the same as a bird count except participants search for and count butterflies at certain sites for a limited period of time. The annual reports are then compiled by the NABA and help determine the geographical distribution and relative population sizes of the species counted. By comparing results over a period of years, scientists and others can monitor changes in butterfly populations and study the effects of weather and habitat change on butterflies. The NABA and other interested organizations then develop plans to protect butterflies from extinction. Why butterflies? Because butterflies can actually represent just how well – or not – Mother Nature is doing. The NABA reports that butterflies quickly react to changes in their environment. A decline in butterfly populations should be treated as an early warning sign for additional wildlife loss. So counting butterflies is much like taking Mother Nature’s pulse. Butterfly habitat, meadows where wild growing plants such as milkweed and violets, each contributors to a butterfly’s life cycle, have, in fact, declined. That and excessive use of pesticides are, according to NABA experts, two of the major threats to the butterfly population. Participants will learn about the habits and habitats of these brilliant insects, visiting four different meadows by caravan. Hike leader and KCAC Chairwoman, Beth Herr, will compile the butterfly sightings and help participants look for butterfly eggs, caterpillars, and chrysalides. In addition to butterflies there are other summer delights which are likely to be found in the tall grass fields and forest edges. “Counters” should be prepared to stand and watch for periods of time. Anyone wishing to bring a pair of close-focus binoculars may do so but a pair of eyes is actually quite sufficient. Participants should wear sturdy shoes and long pants. Please bring water and lunch, but leave the family dog at home for this outing. Children over six years are welcome. Registration is required for the count so please contact Beth at (845) 228-5635. In case of rain – when butterflies wisely choose to stay under cover – the count will be postponed until Sunday, July 19, same time, same place. If that happens we’ll announce it on the home page and by email to hike announcement subscribers. For further information on butterflies and butterfly counts, visit the NABA website. Using a variety of marked and unmarked trails, the leader will assemble a figure-8 hike of about 7 miles that includes the summit and climbable fire tower on Mount Nimham (views to the Catskills and Manhattan) along with other highlights (brooks, caves, abandoned homesteads and mines) of this multiple-use forest that is the center of central Kent. Children are welcome and encouraged, if they can keep up. Appropriate footwear, a trail lunch and adequate water is necessary. Hike Leader: James Shearwood, in partnership with naturalist Beth Herr, the Kent Conservation Advisory Committee and the Mohican Chapter of the Adirondack Mountain Club. Registration: Register in advance at theatre@artsonthelake.org or (845) 228-2685. Participation is limited to what the woods can respectfully handle. Meeting Place: DEC Parking Lot on Gypsy Trail Road, 2 miles north of the intersection with Route 301, on the right after passing the 4-H and County Parks. Rain Date: Sunday, June 14, announced on the Arts on the Lake website by 9 am, if necessary. On Sunday, May 3, 2015 join members of the CAC from 11am to 2pm for our annual hike to two of the Town of Kent’s most interesting landmarks. We’ll meet at the DEP parking area at the end of Whangtown Road. If you haven’t been to Hawk Rock, you’re in for a treat. When the glaciers retreated northward at the end of the last ice age, they were carrying some really big rocks that sometimes ended up in odd positions when the ice melted. One of these so called “erratics” is Hawk Rock. Local lore has it that long ago the Native Americans named it and used the site as a meeting place. It is certainly a believable story; the setting is beautiful and it’s one impressive rock. You can see a picture of it here. The Mead Farm, like the rest of this hike, is on land that was originally part of the hunting grounds for the Nochpeem tribe of native Americans, a part of the Wappinger Confederacy. After passing through various people’s hands, sometime in the 1860s Moses F. Mead purchased the eastern part of the farm where the ruins are today. The site includes a number of interesting features, including the foundations of the house, the stone portions of a cow barn and one of the most beautiful corbelled stone chambers anywhere. This is a moderate hike that takes three hours or so round trip including stops for lunch at Hawk Rock (don’t forget to pack yours!) and to look around the farm site. If weather forces us to cancel or postpone the hike, we’ll let everyone who subscribes to our hikes list know by e-mail and post the news here on the website. Call Beth at 228-5635 for more information. Start the new year with nature and neighbors! Join members of the Kent Conservation Advisory Committee for their annual hike on the first day of January. Meet at 12pm in the DEC parking area on Gypsy Trail Road for a walk in the Nimham Mountain State Forest. There is ample parking, fields, forest and a pond. This easy one-mile hike meanders through meadows, conifer plantations and around a beautiful pond. Its proximity to thousands of contiguous wild acres can make for interesting animal tracks. It is an extraordinarily beautiful place right here in our home town. Come join this excursion through the winter and start the new year in nature. Wear good hiking shoes for a few rock scrambles, and bring water. A light snowfall would provide a canvas for animal tracks, but an icy coating or severe weather would postpone the hike with an email alert by 10am that day, or call 228-5635. Mother Nature decorates our woodlands in celebration of summer with the pink and white blossoms of the Mountain Laurel. This evergreen shrub is common on Kent’s steep slopes and now is the time to see the forest dotted with confection-like flowers. Join members of the Kent Conservation Advisory Committee on a walk around White Pond this Sunday, June 8, at 11am. Learn about the extraordinary pollination mechanism and interesting history of the laurel. Enjoy walking three miles, through different habitats and plant communities, around the clear waters of White Pond. Wild flowers, breeding birds, and animal tracks and traces abound. Wear sturdy shoes, apply tick repellant and bring water and lunch, if you wish. Meet at the White Pond Parking Area. Call Beth at 228-5635 to register or for more information. Join members of the CAC for our annual hike to two of the Town of Kent’s most interesting landmarks. We’ll meet at the DEP parking area at the end of Whangtown Road. If you haven’t been to Hawk Rock, you’re in for a treat. When the glaciers retreated northward at the end of the last ice age, they were carrying some really big rocks that sometimes ended up in odd positions when the ice melted. One of these so-called “erratics” is Hawk Rock. Local lore has it that long ago the Native Americans named it and used the site as a meeting place. It is certainly a believable story; the setting is beautiful and it’s one impressive rock. You can see a picture of it here. This is a moderate hike that takes three hours or so round trip including stops for lunch and to look around the farm site. If weather forces us to cancel or postpone the hike, we’ll let everyone who subscribes to our hikes list know by email and post the news here. Call Beth at 228-5635 for more information. We’ve had to cancel the planned hike at the Fred Dill Wildlife Sanctuary on Fair Street. Conditions at the Sanctuary are just too difficult and dangerous for a hike. The ground is blanketed with deep, ice-covered snow, and the parking area has not been cleared. To top it off, NOAA predicts it will begin to snow another 2 to 4 inches starting about the time the hike would begin. A unique plant community, possibly supporting rare plant species, has been found in Kent. Called a “kettlehole bog,” its location was discovered during a baseline survey of the model forest at Clearpool, a Green Chimneys facility. These bogs form as big chunks of glacial ice are stranded and partially buried in glacial outwash. The ice chunks subsequently melt, leaving ponds in holes in the ground, with no hydrologic inlets or outlets. Over millennia, peat progressively fills in the kettleholes, often forming a habitat for unusual mosses. It is extraordinarily beautiful right here in our home town. Come join this excursion through late autumn, learn some natural history and meet some new neighbors. Hikers should wear sturdy shoes and be able to manage a few rock scrambles. Bring water and lunch. Heavy rain would cancel the hike with an email alert to Kent CAC hikes subscribers and a posting on our home page by 10am that day. Call Beth at 228-5635 for more information. No need to drive too far to enjoy the best of fall colors; nothing beats seeing the brilliance of autumn from the top of Mount Nimham Fire Tower! Join the Kent Conservation Advisory Committee for the annual fall foliage hike. Meet at the DEC parking area on Mount Nimham Court at 1pm for a ramble up a woodland trail past farm ruins, a stone chamber and a peaceful forest. As we hike up the mountain we’ll see subtle changes in vegetation, the woodlands carpeted by ferns of different hues, and and lots of evidence of this year’s abundant crop of nuts. Once at the top, we’ll have time to enjoy the view from the tower. Return will be along the gravel access road, completing a walk of less than two miles. It is extraordinarily beautiful right here in our home town. Come join this excursion through autumn, learn some history and meet some new neighbors. Hikers should wear sturdy shoes for a few rock scrambles and bring water. Heavy rain would cancel the hike with an email alert to Kent CAC hikes subscribers and a posting on our home page by noon that day. Call Beth at 228-5635 for more information.